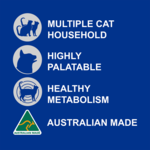 This super premium, Australian-made, dry cat food is complete and balanced to support the nutritional requirements of cats of all ages - from kittens seniors. 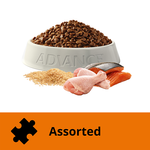 With two different kibble shapes to cater to mouths of all different sizes, this diet is the perfect options for households with multiple cats of different ages. 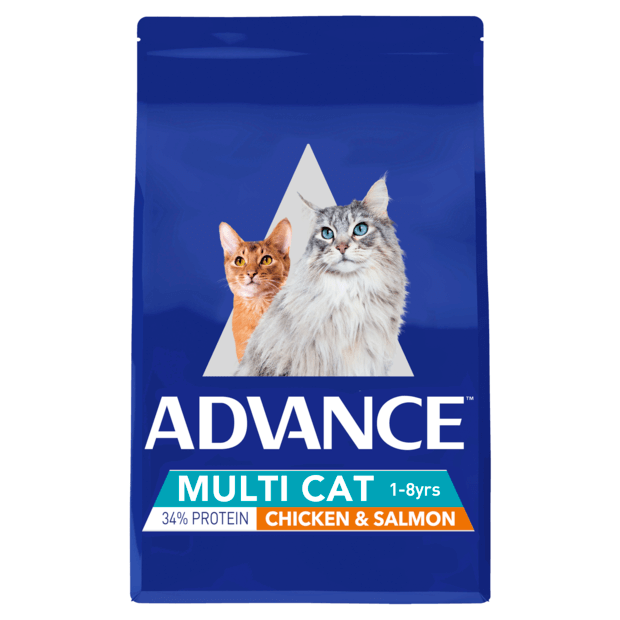 With Advance Multi Cat, you wont need to buy multiple diets for different cats; this convenient all-in-one formula has everything you need. This food contains wholesome, tasty ingredients like lean chicken and delicious salmon, and beneficial nutrients like antioxidants to help strengthen the immune system, and zinc and linoleic acid for healthy skin and a shiny coat. 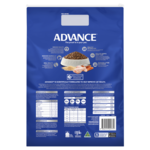 Advance Adult is formulated with controlled mineral levels and high digestibility to help support urinary tract health, and natural yucca extract to help reduce litter box odours. The addition of natural beet pulp to this formula helps to reduce hairball production by assisting ingested hair to move gently through the digestive tract. Looking for a different dry food formula? 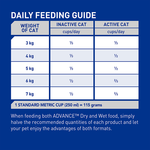 Check out our full range of Advance dry food for cats. After a kitten-specific formula? See Advance kitten formulas. Chicken Meal, Rice, Maize Gluten, Chicken Fat, Salmon, Rice Flour, Natural Flavour (Chicken), Turkey Meal, Salt, Dried Beet Pulp, Minerals, Sunflower Oil, Vitamins, Methionine, Taurine, Sodium Tripolyphosphate, Antioxidants, Colostrum, Yucca Extract, L-Carnitine. My 4 cats all love this food! Not only is it nutritionally a great choice for them, it’s australian made, and a really affordable price, they absolutely love the taste! So easy to put this out and know whoever eats it is getting exactly what they need. I rescued a homeless cat straight off the street and decided to feed him Advance wet and dry food to increase his condition as quickly as possiblebut I was so surprised how quickly and how well it worked. His coat and overall health is amazing and you can tell when I've run out and not had time to get more and had to feed him supermarket brands. 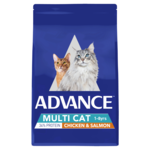 I absolutely recommend Advance cat food for your cats overall health and condition.